I tend to be a pretty upbeat person. I usually always have a smile on my face and try to see the positive side of everything. But there are some days when I find it harder to keep that smile and stay in a good mood. Last week was a test to my positivity. To say that it was a hard week to get through would be an understatement. I could feel my mood changing as the week went on. And I started to feel anxious and depressed. Luckily, I found a natural remedy that helped me. And it could help you, too. I reached for my lemongrass essential oil and put a couple of drops in my diffuser. I had read that it can help with anxiety, stress, and even irritability. And, guess what? After about 20 minutes of diffusing it through the air, it really did improve my state of mind! You may have heard of lemongrass if you enjoy Asian cooking. It’s usually added to curries and soups, or paired with beef, fish, poultry and seafood. It’s also a popular flavor of tea. But lemongrass isn’t only for your food and drinks. The aromatic effect of lemongrass might also be therapeutic. Lemongrass oil’s refreshing citrus scent makes it a valuable therapeutic oil. It has a clean and calming aroma that could help relieve nervousness, insomnia, and grumpiness, as well as prevent drowsiness. Personally, I can’t get enough of the lemon scent. I have even gone as far as purchasing soaps made with lemongrass oil. Starting out the day with lemongrass soap in my shower gives me the boost I need to wake up and be positive. While there isn’t much research on the effects of lemongrass on the brain, doctors of traditional medicine have sworn by this herb as a cure for everything from headaches to depression. Scientists do agree, however, that the possibility of these beneficial effects is likely given the properties of lemongrass. Lemongrass may work as a sedative, which can help relax and soothe the body. The herb reportedly activates the release of serotonin, a chemical in the brain that affects mood. Serotonin regulates anxiety, happiness, and mood. And low levels of the chemical have been associated with depression. 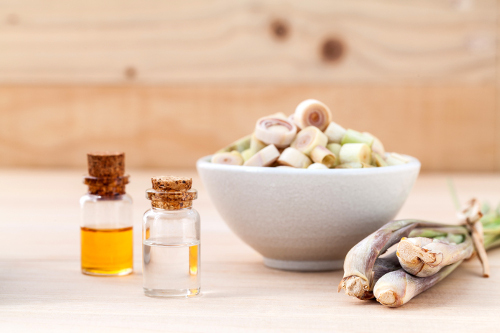 So, how can you use lemongrass essential oil to boost your mood throughout the day? Place three or four drops of the oil into a diffuser and let the aroma fill the air. You can also mix two drops of lemongrass oil with a half a teaspoon of carrier oil such as coconut oil, and rub on your skin to take the aroma with you. As with all essential oils, some people are more sensitive than others. If you are using lemongrass topically, always remember to do a patch test first to check for any skin irritation. Never ingest essential oils. If you need help with managing your depression or anxiety, don’t hesitate to reach out to professionals for counseling. Doctors and depression hotlines around the country are available just for this purpose. You should also contact your physician immediately if you ever have thoughts of suicide. Thankfully, my bad week is behind me. I am feeling more positive and back to my old self again. Ups and downs are a part of life. But even to the most positive person, it can be hard sometimes. It is nice to know that a natural solution could boost my mood if I feel down again in the future. Drew, J., “Effect of Lemongrass on the Brain,” Love To Know; http://herbs.lovetoknow.com/Effect_of_Lemon_Grass_on_the_Brain, last accessed August 9, 2017. “Lemongrass Oil Can Lighten Up Your Mood And More,” Mercola, May 18, 2017; http://articles.mercola.com/herbal-oils/lemongrass-oil.aspx?utm_source=dnl&utm_medium=email&utm_content=art3&utm_campaign=20170518Z1_UCM&et_cid=DM143613&et_rid=2010923329, last accessed August 9, 2017.
http://www.healthline.com/health/mental-health/serotonin#overview1, last accessed August 9, 2017.